Kenenisa Bekele won two gold medals at the 2009 World Championships, held in Berlin. His double victories in 5,000 m (13:17.09) and 10,000 m (26:46.31) were unprecedented and by doing this became the first man to take both the long distance track gold medals at the same World Championships. In spite of his unrivalled success in athletics, he did not experience the mainstream appeal that others such as Haile Gebrselassie did. The son of a farmer, Kenenisa Bekele was inspired to begin running by the athletic feats of fellow Ethiopian Haile Gebrselassie. After setting a world junior record for the 3,000m in 2001, Bekele achieved his first senior success at the 2002 World Cross Country Championships in Dublin, where he became the first man to win the long and short races at the same championships. Bekele retained both titles in 2003 and again in 2004. At the 2003 World Championships of Athletics, Bekele won the 10,000m and finished third in the 5,000m. In the run-up to the Athens Games, during a 10-day period, Bekele broke Gebrselassie’s world records in both the 10,000m and the 5,000m. 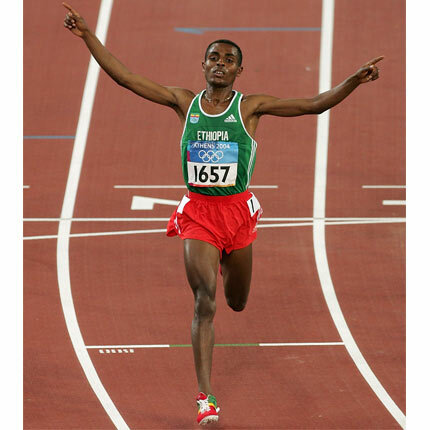 At the Olympics, he entered the 10,000m along with his idol, Gebrselassie, and a third Ethiopian, Sileshi Sihine. The Ethiopians took charge halfway through the race. When Gebrselassie began to fade, Bekele slowed down to allow him to catch up. Eventually Bekele and Sihine pulled away from the other runners, while Bekele finally drove to victory by running the last lap in 53 seconds, setting an Olympic record in the process. Eight days later, he faced 1,500m champion Hicham El Guerrouj in the final of the 5,000m. Bekele took the lead from Eliud Kipchoge of Kenya on the final lap, but with 60m to go, El Guerrouj caught him and won by two-tenths of a second, while Bekele won the silver medal.